Rag rugs are not finished when you cut them from the loom. In fact, they can fall apart if you are not careful. 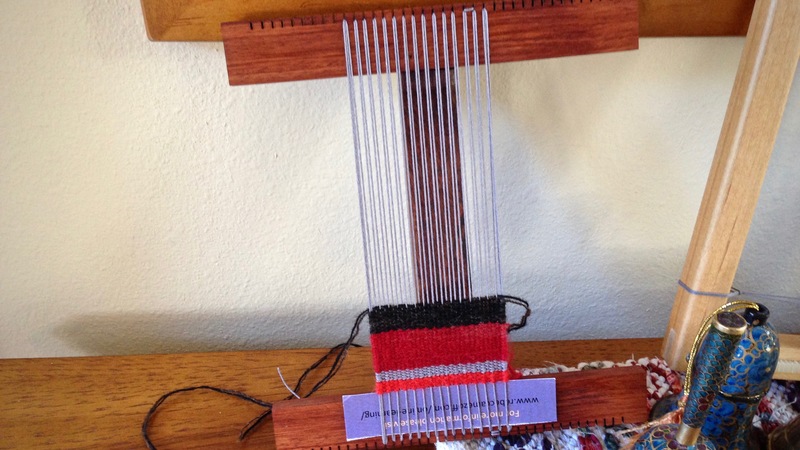 A rag rug is not secure until warp ends are tied into knots. You need to leave space on the warp between rag rugs to make room for the eventual knots. One way to leave space on the warp is by using warping slats as spacers. 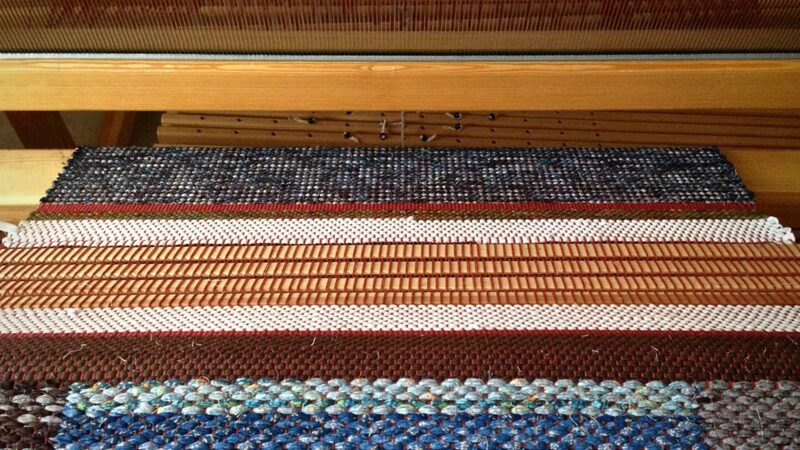 Simply weave about two inches of scrap header after the end of a rug. 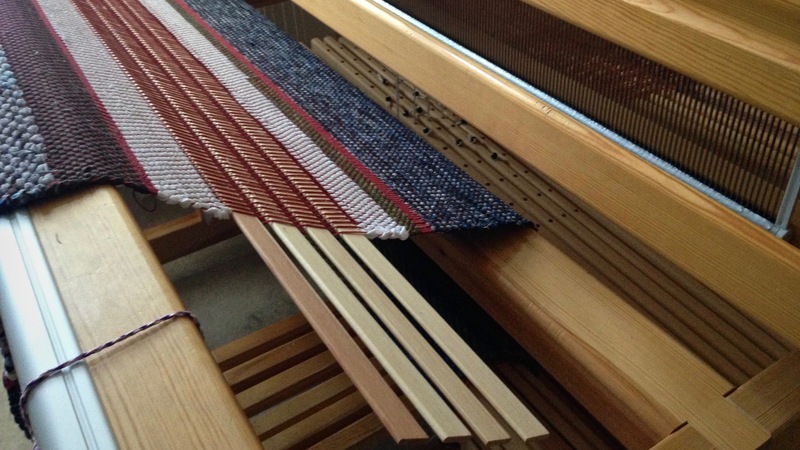 Then, insert warping slats in alternating plain weave sheds. And then, weave another scrap header. Now, you’re ready to start the next rug. 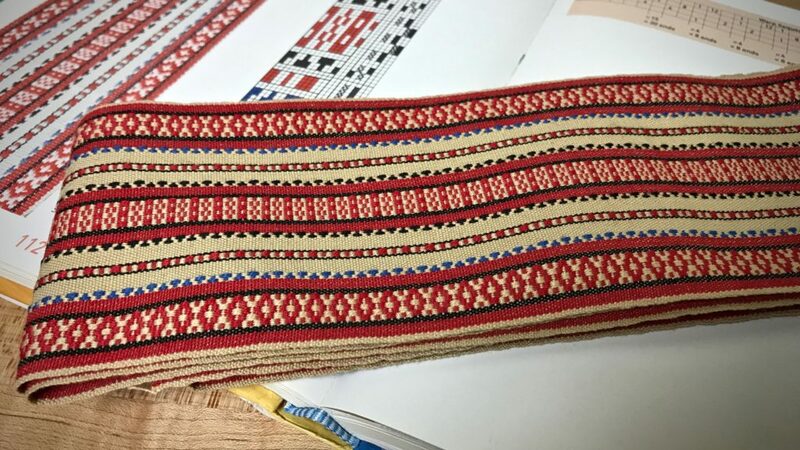 Weaving is finished. It is time to cut these rugs from the loom. 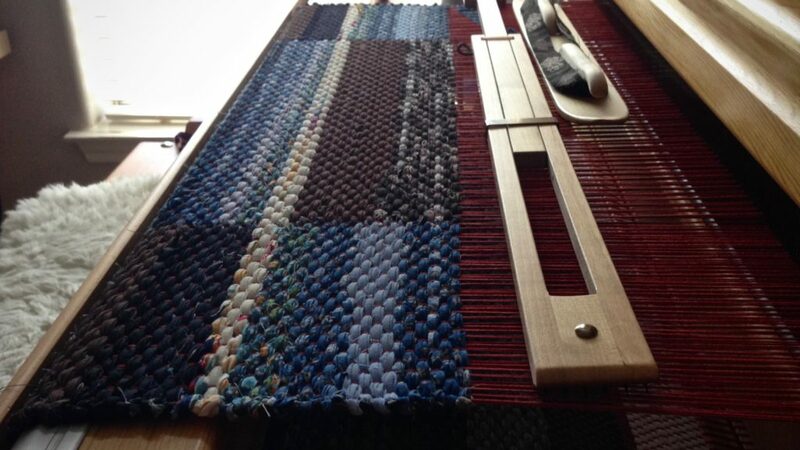 Four warping slats are seen between two rag rugs as the rugs are being pulled off the loom. 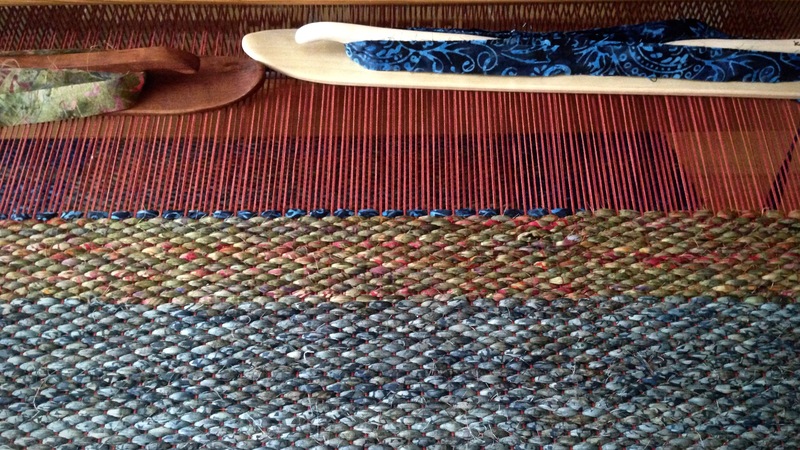 I leave about eight inches (20 cm) of warp between rugs. This gives me enough length for tying the needed square knots. If you are leaving fringe, add enough to include the desired fringe length. 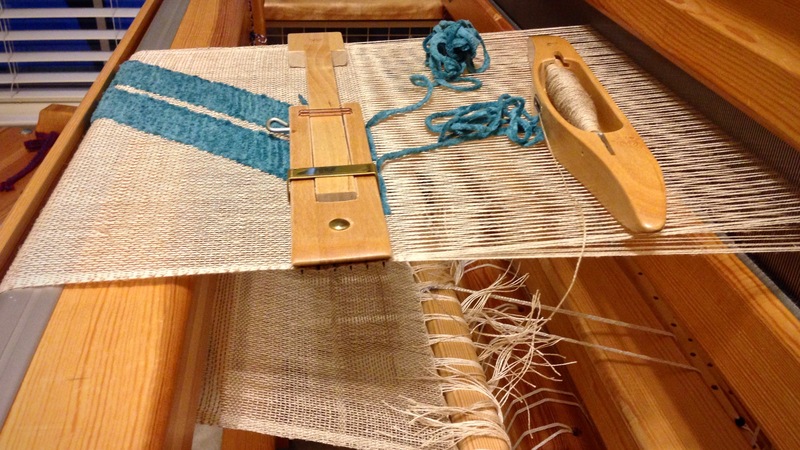 When you insert the warping slats, keep them centered so that they can go around the breast beam and cloth beam without catching on the sides of the loom. Full-width warping slats are placed carefully so that they do not extend beyond the weaving width on the right or on the left. This view is looking down on the end of the breast beam. 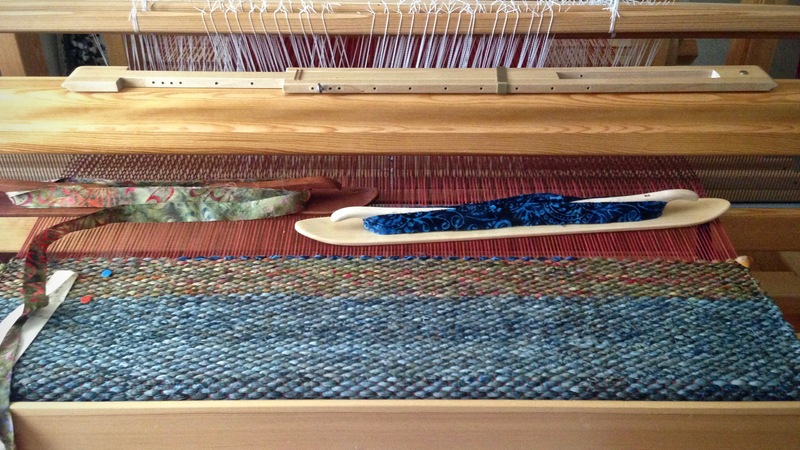 It is easy to separate the rugs after they are off the loom. 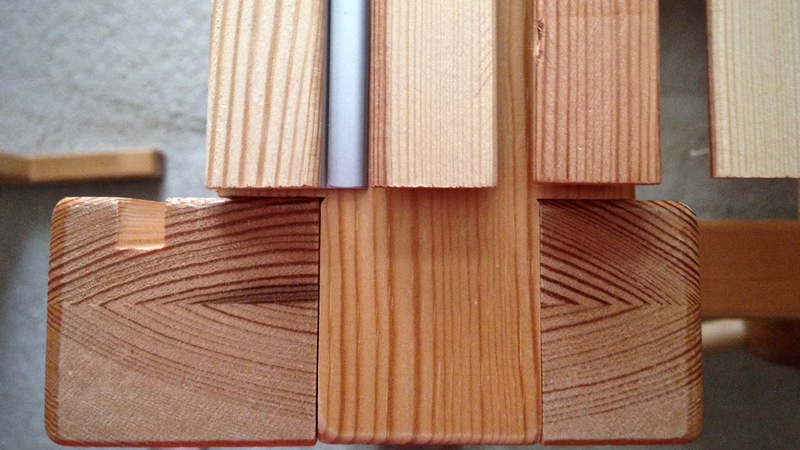 Cut between slats using a rotary cutter, with a cutting mat underneath. Double binding rag rugs are ready to be removed from the loom. The two rugs will be cut apart by slicing the warp between the middle two warping slats. May you make the best use of your time and tools. Why do you tie square knots if you are going to hem the rug? N.
N., The knots stabilize the weaving. 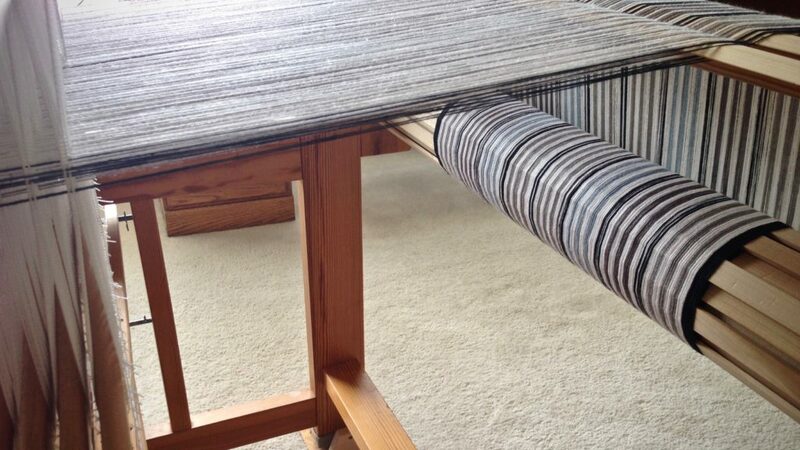 Without something to hold the weft in, even turning the edge to make a hem would loosen the weaving. And, if the hem comes undone in the life of the rug, the knots will still be there holding the rug together. What can you do with odds and ends? Plenty. 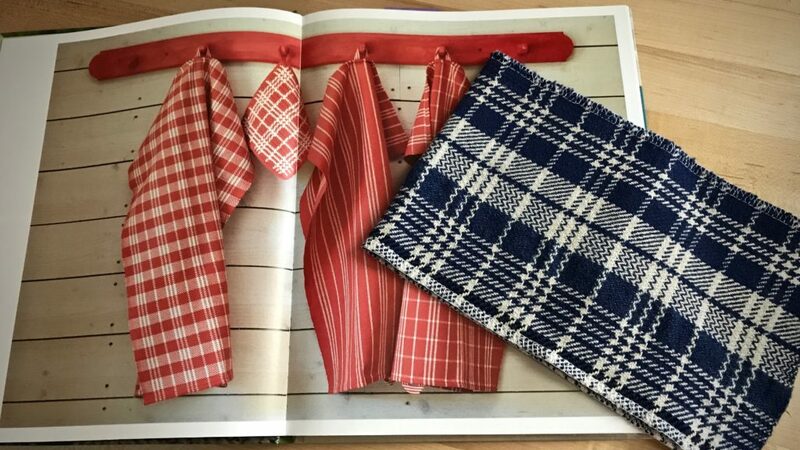 I do use new cotton fabric for my rag rugs. But I refrain from buying new fabric until I absolutely have to. 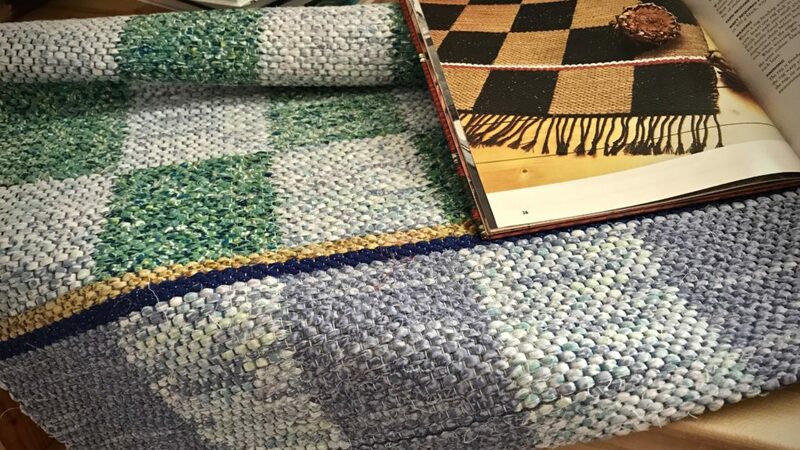 It’s a good challenge to combine available colors from previous rag rug projects to make a new design. 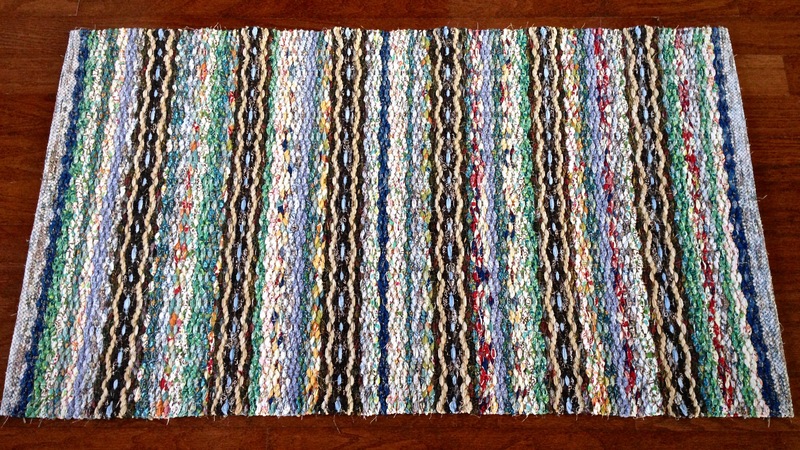 There are two piles of color for this double binding rag rug. The blue pile and the brown/black pile. The color blocks switch places in the rug about every seventeen centimeters, with a three-pick white chain pattern in between. Collection of blue fabric, and a collection of brown and black fabric form the basis of this double binding rag rug. I enjoy combining multiple shades of a color, such as the blue in this rug, to add character. Every odd fabric strip finds a place to belong. It ends up looking cozy and friendly. All the mismatched pieces somehow fit together. We belong to somebody. We belong to the one who made us–the Creator of everything. 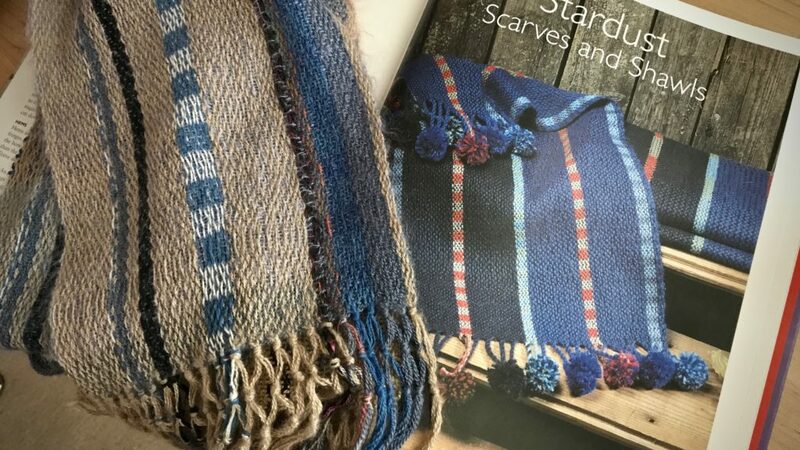 He weaves the fabric strips together to make his beautiful design. Scraps become useful, and colors are mixed and rearranged in interesting ways. Together, the woven mixture has a purpose. A rag rug, made from odds and ends like us, puts the creativity of our Maker on display. May you know where you belong. Very nice rug it will be. I used to make scrap quilts with many odds and ends; it was a challenge to get good balances , but I found it needed one or two dissonant shades to be special. 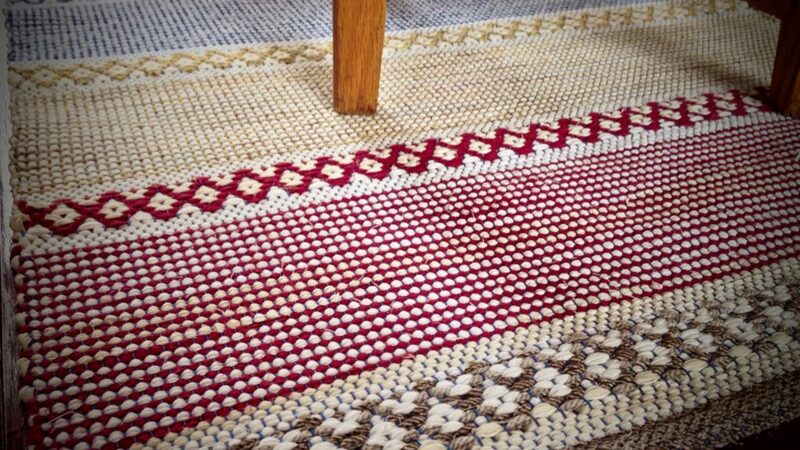 A double binding rug is on the list for me if I ever get this honeycomb warp off. I just buy cotton sheets from the thrift store, and prefer prints mostly for rugs. Fran, yes, getting a good balance in the colors is always a challenge. I like your point about including one or two dissonant shades to make it special! That’s a great tip! My goal for every rag rug I weave is to make a pleasant footpath that lasts through many, many seasons of wear. 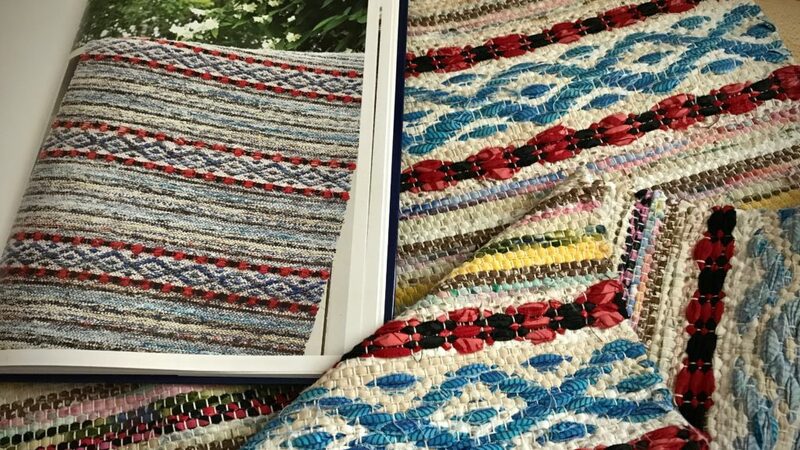 What makes an exceptional rag rug? Quality of workmanship and design. 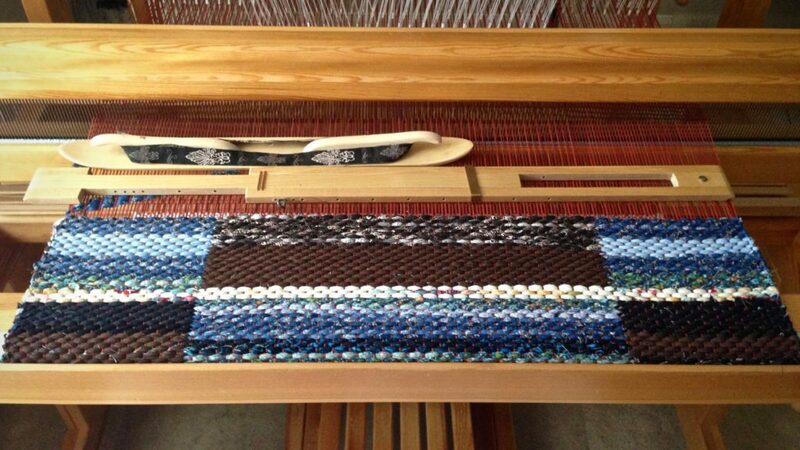 Tightly-packed weft, snug selvedges, and high quality materials produce a strong rug. 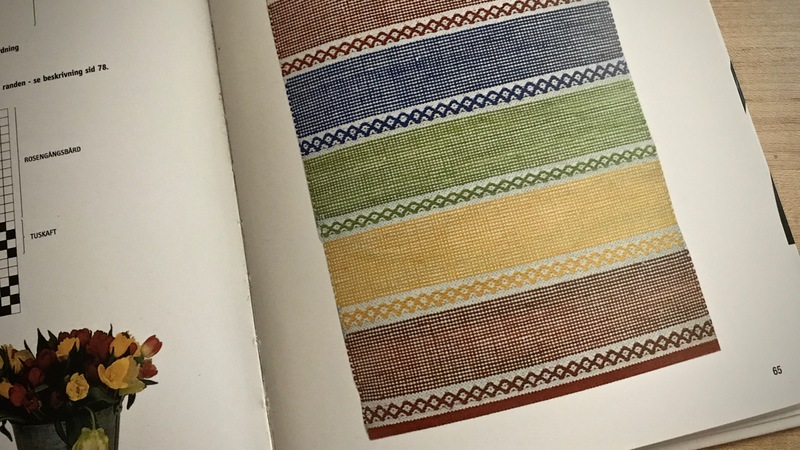 And, great design includes an interplay of weave structure, color, detail elements, and functionality. 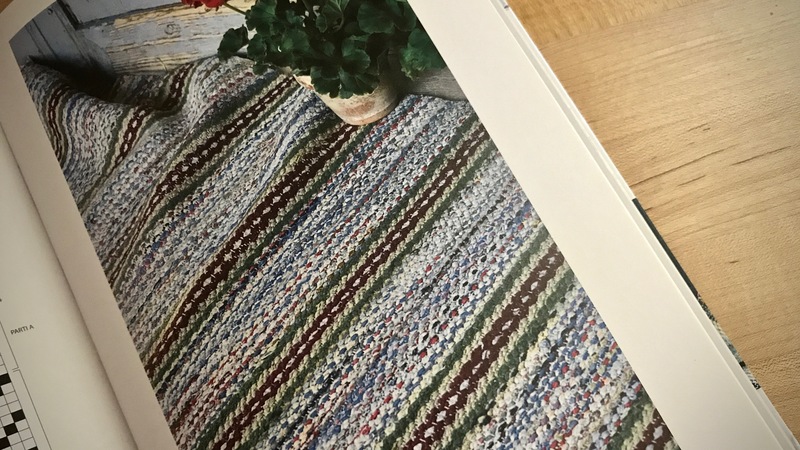 Tightly-packed weft in a double binding rag rug gives no hint of the opposite colors that show on the reverse side. Double binding uses a two-block threading that determines where color changes can occur in the weft pattern. 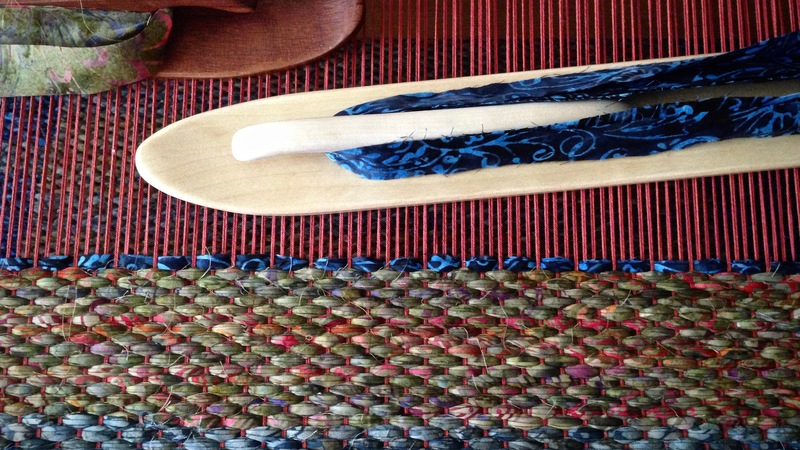 Two ski shuttles are used for weaving the two layers of a double binding rag rug. Consistent tight selvedges contribute to a long-lasting rug. Strength is like a quality handcrafted rug that handles daily foot traffic. And joy is like the artist’s design, the colorful pattern, that is woven into the rug. Strength and joy go hand in hand. We see this in creation. And in our Creator, who gives of himself to those who come near. Be refreshed with strength and joy. I don’t know the term double binding. Do you have a draft I can see? I’ll see if I can find a good way to post a draft for you. (It could be a few days, depending on when my daughter has her baby.) 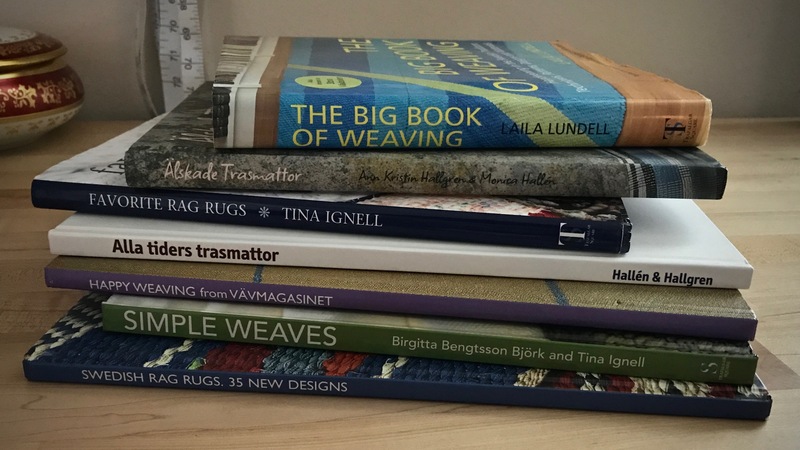 In the meantime, I mention some resources for double binding in my response to Maggie following the post My Favorite Thing to Weave. Tobie, I am sending you an email with a sample double binding draft.